I have been stamping for about 16 years after a friend introduced me to this wonderful art. My favorite technique is: Faux Washi Paper, of course! I also like Polished stone. My fav. colors to work with are: reds, greens, blues, purples and silver. My fav Asian stamp images are: Bamboo, pandas, cranes and dragonflies. Fav. stamping accessories are inks and stamps. I can’t live without my paper cutter. I can’t cut a straight line to save my life. I am linear impaired! My helpful tips are to experiment and try new techniques, new colors, etc. You never know what you might discover! I think I love stamping in the Oriental theme and joined OSA was because of the vibrant colors and the simplicity of design of Oriental stamping. It is serenity to me. I loved reading VSN when it was a magazine and now that it is online, I still enjoy it. I also liked The RubberStampMadness as well. I was published in numerous Vamp Stamp News issues over the years. Thank you, Nancy! I love to read on my iPad, Nook and Kindle. I also love to spend time with family and friends. I am involved with the fire dept. where I live, since my husband is on the fire dept. I have a house full of animals: 2 dogs, 2 cats, 2 guinea pigs, a rabbit, a cockatiel and a fish tank. I love to spend time outside with my flowers and enjoy the woods behind my home. 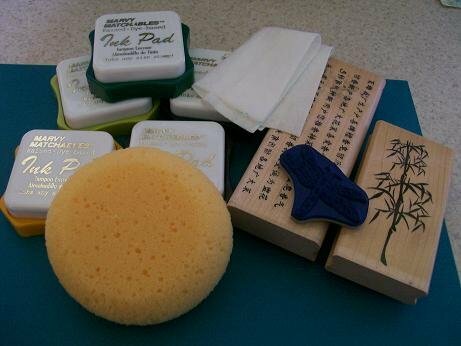 My fellow stampers here at Oriental Stamping Arts, my environment, especially outside, other stamping clubs, stamping magazines and stamping blogs/websites all inspire me. I have NO Art background. I had to laugh at this question because until Rubber Stamping, I couldn’t create art. I think that is the reason I fell in love with Rubber Stamping because I don’t have to draw to create. I have a stamp that I sometimes put on the back of cards above my name. It says,: Hand stamped because I can’t draw. That certainly sums it up for me. I don’t have certain stamp websites I visit everyday, I just see a stamp artist and if I like what I see, I go to their blog or a company’s website. I love looking at About Art Accents, OnyxXpressions website to see how they have used their stamps, etc. I will also go to websites of companies who are featured at Stamping Conventions. I work 2 twelve-hour night shifts as an RN. My background is Critical Care Nursing but for the past 5 years I have worked in a Regional Call Center for the hospitals in our system. I have been a nurse for 30 years. I find that stamping helps the stress level I get from work. I live in Hudson, OH. It is between Akron and Cleveland, OH. It is a beautiful city over a hundred years old. Lots of century homes. My husband has lived here all his life and is the Fire Chief here. He is a fifth generation firefighter. I have 3 kids: Dan is 23, Jessie is 21 and Jake is 16. I am blessed to have a wonderful family, friends and home full of love and support. My husband builds me shelves and anything I might want for my stamping lifestyle. He is a wonderful partner in everything. I also feel blessed to have wonderful friends thru stamping groups like OSA and Club Posh. 1. 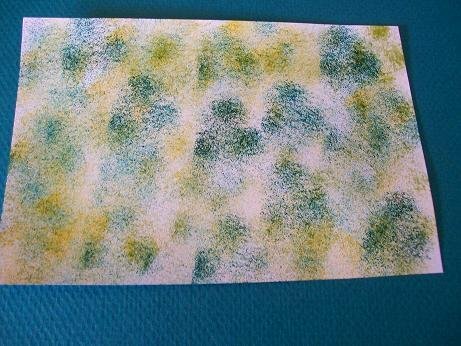 Sponge your glossy photo paper with your dye inks: I started with Celery, then Brilliant Yellow and then Bottle Green. 2. Then take your baby wipe and blend the inks together. 3. Take your stamps and intermittently start to stamp them on the paper in whatever pattern you want to use. 4. 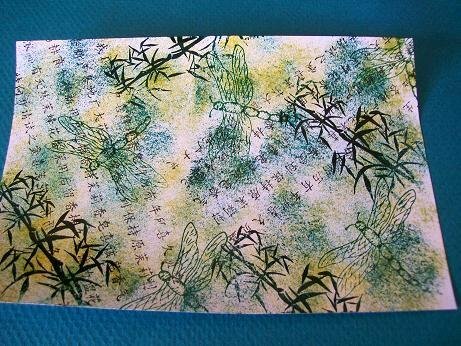 I stamped the Oriental Foliage in Bottle Green Marvy ink, Oriental script in Black Marvy ink, and finally the Dragonfly in Green marvy Ink. So, this is your Faux Washi Paper. 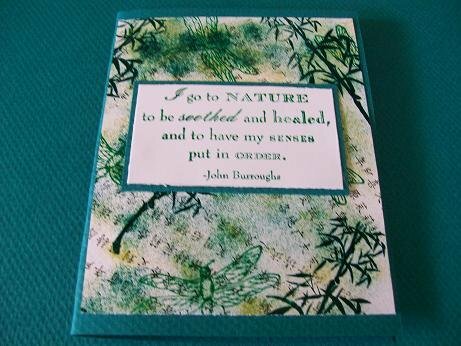 I made a card with the stamp “I go to Nature” by Impression Obsession to showcase the Faux Washi Paper. Hope you enjoy this making this Faux Washi Paper as much as I did. The glossy photo paper really pops the colors and makes it beautiful. Great project! Thanks for the great tutorial! Loved your profile and getting to know more about you! Enjoy your month in the limelight! Congratulations Debbie and enjoy your month of fame as SAM of july 2014. Like your card and tutorial, going to give it a try…for sure. Good morning Debbie. Love your washi paper tutorial as I also like to experiment but have never attempted your technique which I must try. It is beautiful. Happy you agreed to be the July SAM as your cards are always stunning. ENJOY being OSA July SAM. Wonderful tutorial on making the faux Washi paper…thank you so much – will have to give this a try!!! Congrats on being July SAM…enjoy every minute! this is such a beautiful background you created-love the color palette. Congrats on SAM! Congratulations Debbie on being our July SAM! Loved reading your bio and the faux Washi paper is beautifully done. I so agree with you on the wonderful friends through OSA and I would like to add the organization of this group makes it all flow so well. Enjoy the limelight and thanks for sharing. Hi Debbie, Congratulations on your achievement of SAM for July 2014! Your project is very fresh and interesting! I love the colours you used. I shall have to try this myself. What a beautiful and fascinating project! I loved reading your bio too! Congratulations on becoming this month’s SAM, Enjoy!